The other day my wife and I had a conversation about foods from the 50s. So many of them were essentials, and they now have fallen off the radar. I guess we were thinking of wedge salad. You know, a wedge of iceberg lettuce topped with thousand island dressing. I haven’t seen that in a restaurant for years, but every single place in Shreveport had its own version on the menu. Probably more ubiquitous in those ancient days were gelled salads. I am certain they were inspired not only by the public information officers of the Jello company, but also by early editions of The Joy of Cooking which included them in its long list of open-a-can recipes. There are several recipes in our family cook book including my mother-in-law’s lime Jello and cottage cheese, my mother’s strawberry Jello with canned fruit cocktail, and the festive holiday special, wild cherry Jello with Coca Cola, cream cheese, and pecans. Unfortunately, tomato aspic was lumped in this category of salads, and it also fell out of flavor. Inspired by the conversation, I decided that a tomato aspic was just the thing for a hot summer evening. Then it occurred to me that variation might be better. A few weeks ago, one of my El Paso friends and fellow blogger (Jim Hastings, The Gringo Gourmet) had written about a Border classic, Mexican shrimp cóctel, made with tiny shrimp, other seafood, crunchy vegetables, and tomato-clam juice. If you have ever lived on the US-Mexico Border you know that there are two sure-fire cures for hangover, menudo and tomato-clam juice, so some of the popularity of the cóctel might be explained by its restorative powers. Whatever, it seemed like a good jumping-off place for a refreshing summer aspic. You can make the aspic as festive as you would like. If you are really feeling up to it, you can set it into a party centerpiece. Gel the mixture in an ornate mold or individual molds to be unmolded and ceremoniously brought to the table. I chose the more pedestrian approach of letting it gel in the bowl I used to mix it in. Also, you can decorate it with avocado or greens, and top it with mayonnaise or aioli. Honestly, I like it just plain with a little avocado on the side. Pour the water into a large mixing bowl. Sprinkle the powdered gelatin onto the surface of the water and allow it to “bloom” for about 5 minutes. It will not fully soften with a shorter time, and it becomes hard to dissolve with alonger time. Meanwhile heat 2 cups of the tomato-clam cocktail juice to boiling. When the gelatin is fully bloomed, pour in the hot juice and stir continuously until the gelatin is completely dissolved. This is a critical step because if the gelatin is not completely dissolved it will form tough lumps in your finished aspic. Add the lime juice to a 2-cup measuring cup and add enough tomato-clam juice to make two cups. Stir this into the gelatin-juice mixture until it is completely incorporated. Let the mixture cool for 5 minutes on the counter top. Then cover tightly with plastic wrap and chill in the refrigerator. In about 1 to 1½ hours, the mixture will begin to set up. It should have the consistency of thick cream. It should be thick enough that the foods you add will not float to the top, but not so thick that you cannot incorporate them evenly into the mixture. Stir in the shrimp and vegetables, making certain that they are evenly distributed. Cover again with plastic wrap and return to the refrigerator. Chill for at least another 2-3 hours. If you have decided on the fancy approach, remove from the refrigerator when you are ready to unmold. Place the mold or molds in a sink of hot water for no more than 15 seconds, being careful not to get water on the surface of the aspic. Have a plate or plates ready for the unmolding. Serve with cilantro leaves and sliced avocado or on a bed of lettuce. Add a dollop of mayonnaise if you like. This will be my last post from Unscene Shreveport. Actually, I am already home, but I wanted to describe the final event for Sarah and Evan. Now, after two weeks of looking after a three-year-old and a three-month-old, my wife and I plan to rest. On Saturday night, the Shreveport Municipal Auditorium became the focus of the food week. There was a small farmers market set up in the lobby, and fifteen local chefs joined Sarah and Evan to prepare an amazing array of dishes that were supposed to focus on the farm-to-table concept. Most, although not all, used products from the farmers market as the main ingredients in their foods. As well, one local artist was assigned to each of the chefs to capture the food in images. Then there was music, bright lights, colored lights, and wine to establish a party atmosphere. And it was a party – about 600 people showed up. The Municipal Auditorium is a classic Art Deco building that was completed in the late 1920s or early 1930s. For many years it served as the home of the Louisiana Hayride, a strong radio competitor with the Grand Ole Opry. Many of the greats of country music performed at the Hayride, including Hank Williams and even Elvis Presley. In fact, the street in front of the building has been renamed Elvis Presley Avenue. After the Hayride shuttered its doors, the auditorium fell on hard times. Paint peeled, plaster became loose, and windows got broken. Except for high school graduations, the space was on its way to becoming derelict. In recent years, however, the buildings around have been cleaned up or knocked down, and the Municipal Auditorium has had lots of love and care to restore it to its original grandeur. Sarah, Evan, and their Shreveport host, Chef Jason Brady served pork panzanella using the hog that they had butchered on Thursday. After all of that, there was no reason that anyone should go away hungry, but there was one more opportunity for food. Sarah and Evan served their gourmet popcorn to those who wanted to stay for a showing of the movie, Ratatouille. Louisiana is culturally divided into the north and south. Shreveport was the jumping off place for the Texas Trail, pioneers coming up the Red River and then driving wagons into Texas. So the culture is much like the rest of the South. On the other hand, French colonists were resettled from Acadia in Canada (Remember Longfellow’s poem, Evangeline?) Acadians became known as Cajuns and much of their culture has persisted, modified by the difficult living conditions and rich food bounty of the swamps. Over the years, Cajun traditions have spread norh, but it is sometimes hard to find authentic Cajun food nearby. My friend, Reggie Graves, who grew up in East Texas but has lived in Louisiana for many years, told me about a fairly new place near where we are staying. Bergeron’s of Shreveport (Bergeron is one of the common Cajun surnames, so it must be the real thing.) One reason Reggie suggested the place is that they make delicious meat pies. I drove down the road to find Bergeron’s and pulled in to a shady parking spot under a huge live oak. The store is reminiscent of the country stores you see in Cajun Country, and the inside was also similar. No place to sit and eat, but cases of food are lined up along the walls and in front of a counter and cash register. There was a big tub of cracklins against the back wall. 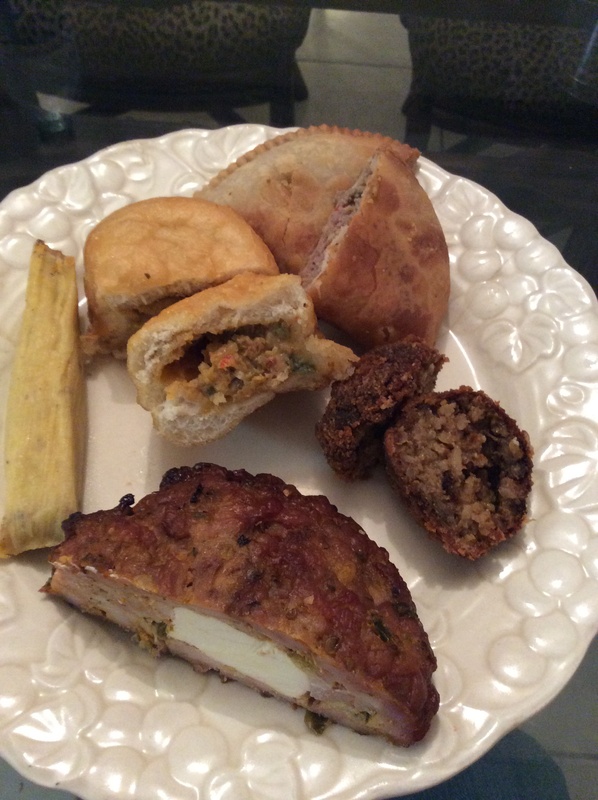 They sell fresh, cooked, and frozen meats, boudin, soups, and prepared items. Bergeron’s had more than enough to add to the menu for our dinner menu I had planned that evening. 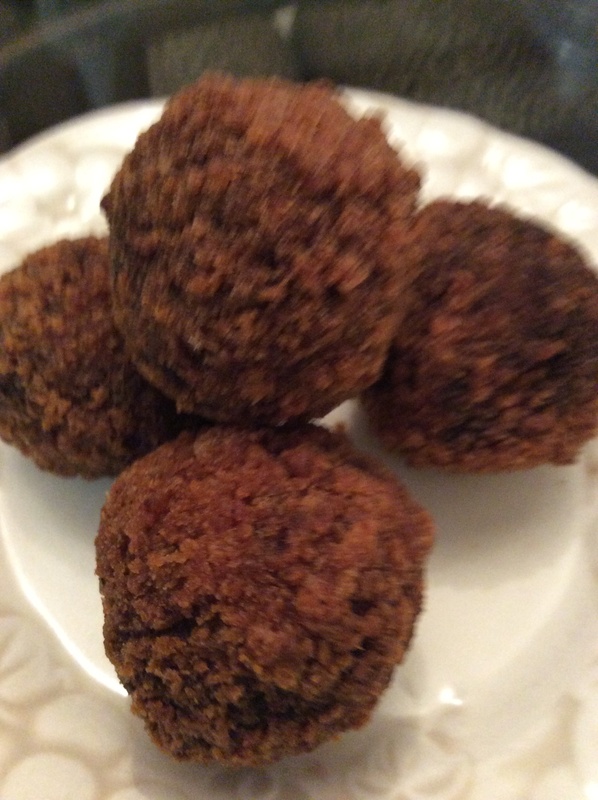 I bought boudin balls – balls of rice-based boudin sausage coated with spicy bread crumbs and deep fried. Next was crawfish pistolles. 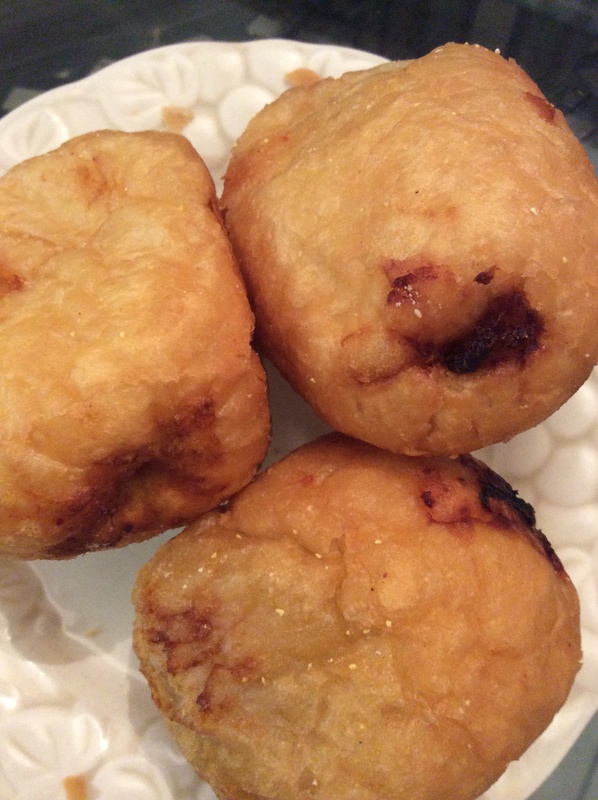 For these you take brown-and-serve French rolls, hollow them out, stuff them with a spicy crawfish mixture, and then deep fry them. I am not making this up. 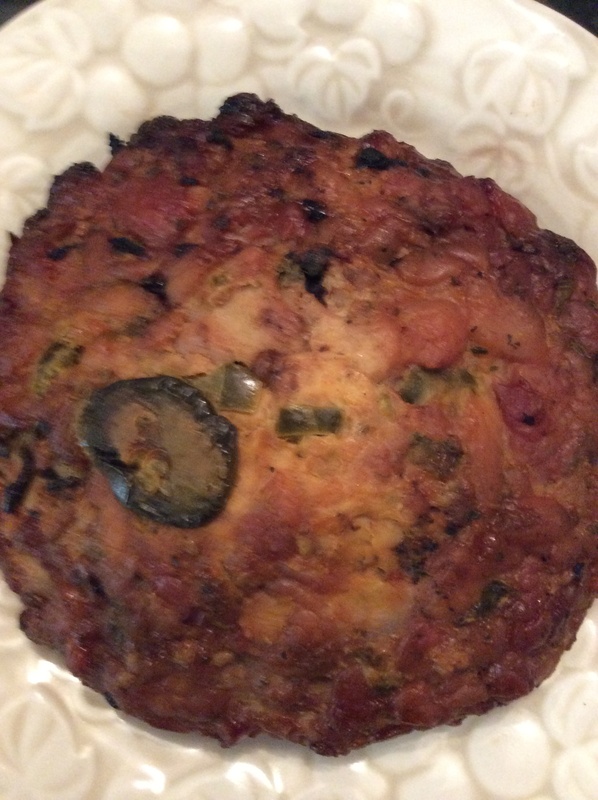 Then there were chicken patties made of spiced, chopped chicken stuffed with cream cheese and jalapenos, and, of course deep fried. Finally, I got some meat pies. 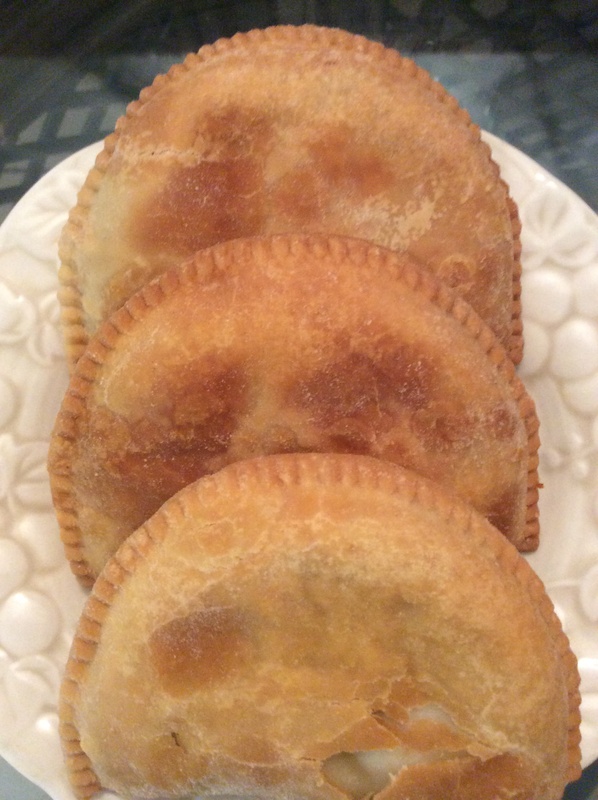 The originals are from a quaint town south of Shreveport, Natchitoches (nack-a-tish) and they are called Natchitoches meat pies – really like a highly seasoned empanada containing a rich beef and pork farce. 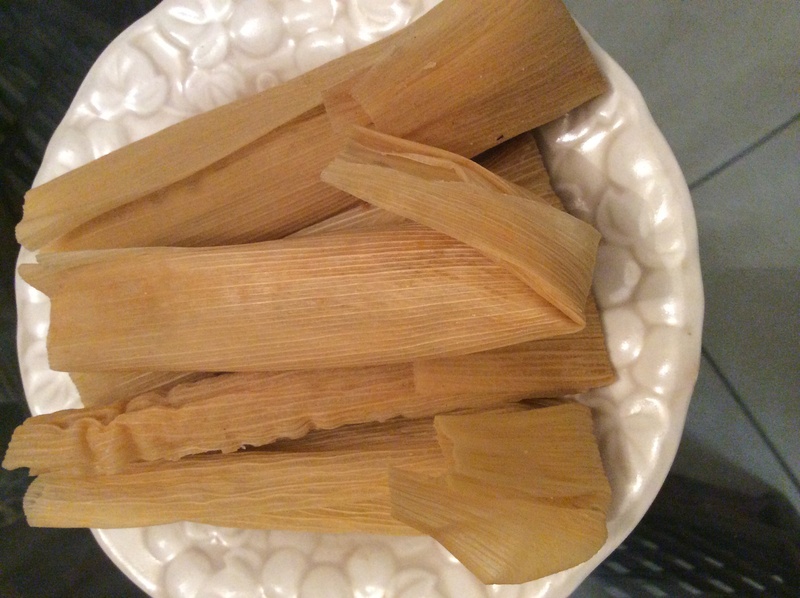 No one is exactly sure of the origins of Zwolle tamales and Natchitoches meat pies. My thought is that both are very old towns and right on the border between the old French and Spanish empires of the region. Borders shifted constantly, and I am certain that settlers did as well. The food all turned out to be delicious, but my one piece of advice is to be sure to take your Lipitor, and have a big bottle of Tums at your bedside. Trigger warning: this post is not for vegetarians. As part of their residency in Shreveport, Sarah and Evan were asked to demonstrate how to butcher a whole hog. The program was designed for professionals so that they would consider buying whole animals or primal cuts instead of just ordering chops or steaks from the restaurant food supply company. In that way, they could use everything, both as a cost-saving measure and as a way to think of new uses for meat cuts that they had never tried before. No, Sarah did not slaughter the pig, but it came close: the animal was bled, skinned, and cleaned of offal, but otherwise it came snout to tail with suggestions on how to use every part. Sarah’s tools included knives that she spent all morning sharpening, a big cleaver, and a hack saw that she bought from the hardware store. The audience included restaurant professionals, enthusiastic amateurs, old folks who recalled butchering a hog on their grandparents’ farm, farmers from the farmers market who were interested in sustainable farming, and students from the local culinary training program who mostly slept in the back of the hall. Evan talked while Sarah talked and demonstrated how to separate the various cuts of meat. She carved out the tenderloin, chops, roasts, hams, and pork belly. She showed how to trim excess fat, and how to remove silver skin for a more tender cut of meat. In the end, she demonstrated how to get hog cheeks – a delicacy – and what to do with the whole head. Several older people were very interested in that because they remembered making souse and head cheese when they were younger. In the end, it turned out not to be a beautiful or tasty demonstration, but one that everyone found interesting – except the culinary students. Last night we ate at our apartment after Sarah, Evan, and Van went fishing with Jason Brady and his family. 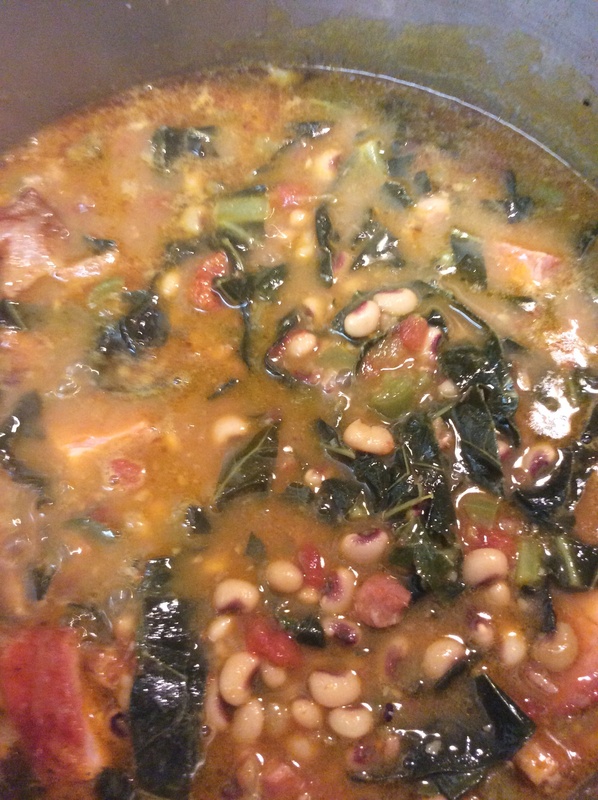 It seemed like a perfect time to cook up some purple hull peas I had bought at the farmers market. I went to the grocery store to get some salt pork and tasso, but I probably could have found those at the farmers market, too. You can’t have peas, tasso, and collards without some cornbread to sop up all of the juices, but none of us was in the mood to bake cornbread in our understocked apartment kitchen. Fortunately we had some leftover corn muffins that had been served with our chicken fried steak at Strawn’s for lunch. The muffins were sweet (Yankee cornbread in Louisiana!?) but they would have to do. I cooked the meal while the fisher persons were out on the lake. In a large, covered pot heat the oil over medium-low heat. Add the onions, cover, and sweat until the onions are soft and translucent. Transfer to a bowl. Bring water to a boil in a small saucepan and add the salt pork. Return to the boil and boil for 5 minutes to remove any excess salt.. Drain and transfer to the large pot over medium heat. Stir frequently to allow light browning. Return the onions to the pot. Add chicken stock and bring to the boil. Stir in the peas, bell pepper, and garlic. Adjust seasoning with salt and pepper. Return to a boil and then adjust the heat to a simmer. Simmer, covered for 1 hour or until the peas are soft. Stir in the tasso and simmer for another 30 minutes. Add the collard greens and simmer for another 30 minutes or until the greens are thoroughly cooked but not limp. Adjust the seasoning. Be sure to use hot sauce if you like it.